We present the theoretical background of our Electrostatic Complementarity™ descriptors along with several case studies showing the practical application of the scores to the prediction of activity and of the visualization to ligand design. In this case study, we used the Electrostatic Complementarity™ maps available in Flare™ to investigate the protein-ligand electrostatic interactions and the SAR of a set of inhibitors of the X-linked IAP (XIAP)-caspase protein-protein interaction. Electrostatic Complementarity scores calculated with Flare were used to quantitatively model XIAP-BIR3 pIC50. Protein interaction potentials and ligand fields, as implemented in Flare, are a powerful way of understanding the electrostatics of ligand-protein interactions. The inclusion of stable water molecules following a 3D-RISM analysis dramatically improves the precision of the method for the characterization of protein active sites. Exploring the application of ligand and protein electrostatics to the design of new molecules using our applications Torch™ and Flare. In this case study, protein interaction potentials implemented in Flare were used to calculate a detailed map of the electrostatic character of the protein active site of Bruton’s tyrosine kinase (Btk), and compared to ligands fields to get a detailed understanding of ligand binding and SAR. Demonstrated that use of pharmacophore constraints with Cresset electrostatic and shape based scoring method is generally favorable. A client asked Cresset Discovery Services to generate new ideas for lead structures in this area, using the natural ligand as a starting point. Cresset scientists used Blaze to find new active structures with diverse chemotypes. Cresset consultants were asked to identify novel active compounds for a class II GPCR receptor. There were no known small molecule inhibitors, so the only information available was the natural ligand, a 34 residue peptide. From sparse experimental data, four areas of the native ligand were identified as major binding regions. The field patterns of these regions were determined and used as input to a Blaze virtual screen. A 30% hit rate was achieved with the hits all being drug like small molecules. This case study uses different virtual screening methods to explore the performance of field and shape-based approaches on a fragment discovery project, comparing and contrasting the results from each. In this case study, a Blaze™ database of approximately 200,000 compounds from ChEMBL2 was prepared in a seamless manner using a KNIME workflow and standard Blaze database creation routines. Cresset consultants were asked to identify drug-like chemotypes to mimic the activity of a series of peptides. Several novel lead molecules were identified for the client, Senexis. Macrocyclization of pharmaceutical compounds plays an increasing role in drug discovery. Macrocycles can provide several advantages such as favorable drug-like properties, and increased selectivity and binding affinity. Here we present a case study of designing macrocyclization strategies for reported BRD4 inhibitors with Spark™, Cresset’s bioisostere replacement and scaffold hopping tool. See how Spark successfully designs macrocycles that are identical or very similar to reported BRD4 macrocycle inhibitors. The creation of fragment databases from proprietary collections of compounds can be a powerful way of increasing the chemical diversity available to Spark. Learn how combining the power of Spark with the use of ‘chemistry-aware’ reagent fragment databases allows for exploitation of specific chemistries in the laboratory. This poster examines what rings have been used by medicinal chemists and cluster them based on their substitution patterns and electrostatic properties. In this case study, the reagent databases based on eMolecules building blocks available with Cresset’s Spark software for bioisosteric replacement were used to identify alternative R-groups for selective inhibitors of the c-Met Kinase. The results suggest that working in successive rounds of optimization, choosing for each Spark experiment the starter molecule with the best activity profile, is an excellent strategy to rapidly identify the R-groups associated with the highest activity or optimal overall profile. The use of databases derived from available reagents ensures that the results can be tethered to molecules that are readily synthetically accessible. Spark was used to carry out a water displacement experiment, starting from the published X-ray crystal structure of a selective inhibitor of Bruton’s tyrosine kinase (Btk). Spark was able to displace the water molecule bridging the interaction between the inhibitor and the P-loop backbone residues of Btk, correctly identifying the same alternative bicyclic indazole fragments found in the original publication which makes a direct interaction with the protein. The availability of a sufficiently diverse source of reagents was crucial in demonstrating the feasibility of this approach. We present the methodology together with applications to core replacement and to fragment growing/optimization. 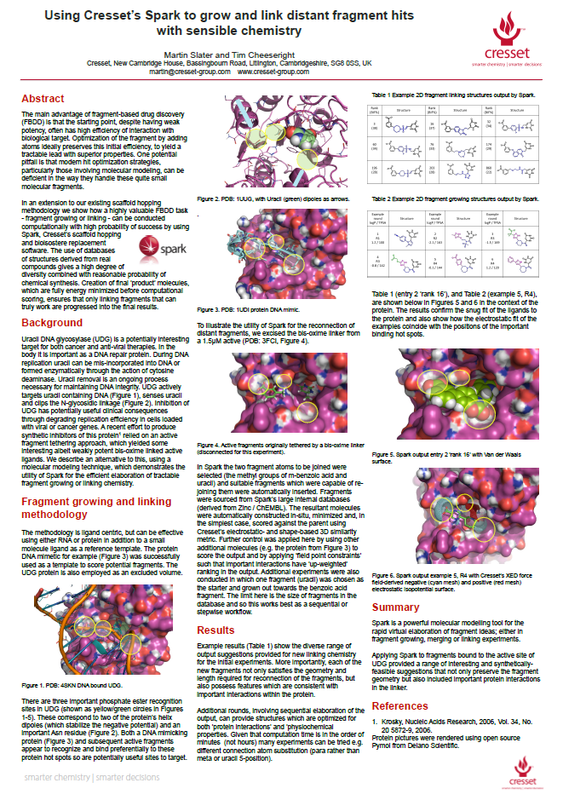 This poster demonstrates how applying Spark to fragments bound to the active site of UDG provided a range of interesting and synthetically-feasible suggestions that not only preserve the fragment geometry but also included important protein interactions in the linker. We show how Spark can be used to rapidly generate potentially valuable chemical ideas for new DPP-IV inhibitors. Working from just a 2D fragment of a known active D3 antagonist we show how Spark was able to quickly identify a variety of alternative scaffolds, some of which have proven D3 activity. This case study shows how Spark was used to find novel bioisosteres for mGluR5 modulators. The scaffold hopping technique using molecular fields identified existing and potential new intellectual property in this busy therapeutic space. A three way collaboration between Cresset, the University of Newcastle and Sygnature Discovery. This case study details a Spark experiment to replace the heteroaromatic scaffold of Sildenafil. The excellent results demonstrate the superior performance of Cresset’s XED force field in describing aromaticity. Spark reagent databases are a great way to explore the chemistry that is accessible to you today. In this case study they are used to grow a fragment lead and generate novel and credible results. In this poster we will show the use of activity cliff analysis in 3D as implemented in Activity Atlas™ and Activity Miner, to explore the SAR of different GPCR data series and understand the electrostatic, hydrophobic and shape features underlying receptor activity and selectivity. Protein interaction potentials and ligand fields are a powerful way of understanding the electrostatics of ligand-protein interactions. The knowledge gained is invaluable for informing ligand design to optimize activity and selectivity. Demonstrates how applying Activity Atlas to activity deltas rather than to absolute activities provides additional insight into the often conflicting requirements of selectivity across multiple subtypes. Exploring the application of ligand and protein electrostatics to the design of new molecules using our applications Torch and Flare. Forge™’s Activity Atlas™ models are combined with Spark’s ability to suggest novel, synthetically accessible modifications for your lead structure to explore possible moves from a range of CDK2 inhibitors. See how Activity Atlas is a powerful way of summarizing SAR data in 3D. By combining information across multiple activity cliffs, it enables a global view of the critical points in the activity landscape. Computational modeling techniques, including both structure and ligand centric methods, are still key for understanding SAR around positive and negative potentiators of ion channel currents. Presentation of a technique for locating activity cliffs in the context of the target active site. Using this method critical SAR regions are clearly and rapidly identified. Furthermore the reason for the activity differences between pairs of compounds is readily discernable, leading to a true understanding of the SAR landscape. A robust 3D-QSAR (Quantitative Structure Activity Relationship) model was built for a data set of 73 dipeptidyl peptidase IV (DPP-4, a serine protease) inhibitors using Forge, Cresset’s powerful ligand-focused workbench for understanding SAR and design. Ad hoc Forge 3D display capabilities were used to visualize and interpret the model. In this case study, Activity Atlas was used to analyze the SAR of a series of adenosine A1, adenosine A2a and adenosine A3 antagonists, with the objective to investigate and understand the electrostatic, hydrophobic and shape features underlying receptor selectivity. This case study demonstrates the use of Activity Atlas in analyzing the SAR of the phenyl ring in a small series of Nav1.7 sodium channel antagonists, in the absence of crystallographic information about the bioactive conformation. Activity Atlas was used to analyze the SAR of a large data set of Orexin 2 receptor ligands taken from the US patent literature, with the objective to quickly investigate and understand the electrostatic, hydrophobic and shape features underlying the receptor activity of a recently published scaffold. The XED force field uses multi-poles to model negative electron density resulting in enhanced description of intramolecular interactions and substituent effects on aromatic systems. The effect of using the XED force field was studied by modeling the positive and negative molecular interaction fields around a series of well known heterocycles. Activity Miner was used to investigate the SAR for a series of DPP-IV inhibitors. Electrostatic differences around a key aromatic moiety accounted for the observed activity changes and were rationalized with respect to the protein structure. We present Forge, an integrated approach to producing 3D-QSAR models, utilizing our field point descriptors. These descriptors are used first to align molecules, either using a free alignment or by first aligning common substructures. Once the molecules are aligned, the collective field points of the training set are used to derive a gauge-invariant set of sampling points, which reduces the number of descriptors that need to be considered while ensuring that all regions around the molecule which might contribute to activity are adequately sampled. Finally, sample values are calculated and a Partial Least Square (PLS) model built. Macrocyclization of pharmaceutical compounds plays an increasing role in drug discovery. With restricted conformational flexibility, macrocycles can contribute to improved binding affinity, selectivity and drug-like properties. Prediction of effective macrocyclization strategies prior to synthesis is crucial. Spark, Cresset’s bioisostere replacement and scaffold hopping tool, allows for rapid and accessible macrocyclization design that retains the bioactive conformation and electrostatic character of a known active molecule. We demonstrate that it is computationally feasible to cluster very large data sets of compounds according to electrostatic and shape properties. The result is an extremely information-rich fragment library. In this example, Spark is used to generate ideas for possible starting point for a library base on S-adenosyl methionine (SAM), a co-factor used as a biological methylation synthon. This case study shows how FieldTemplater, working from just a few 2D structures of known active CCR5 Chemokine Receptor inhibitors, was able of correctly reproduce the bioactive conformation of the CCR5 receptor inhibitor Maraviroc as derived from the 4MBS PDB crystal structure, without making use of the X-ray information about the binding mode of this ligand. Additionally FieldTemplater indicates the relative alignments and likely bioactive conformations of 3 further CCR5 inhibitors. In this case study, two different Lead Finder docking modes (standard and extra precision) were used in docking studies on a small number of Factor-Xa (FXa) protein-ligand complexes originally used in the CSAR 2014 benchmark exercise.